Got noticed sans any quid pro quo. Though no point in boasting in my own Backyard.. 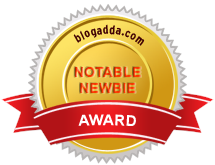 Thanks Blogadda -for the award !